Lung cancer is one of the most common and burden disease worldwide including Thailand. Its mortality is highest compared to the other cancers in Thailand. 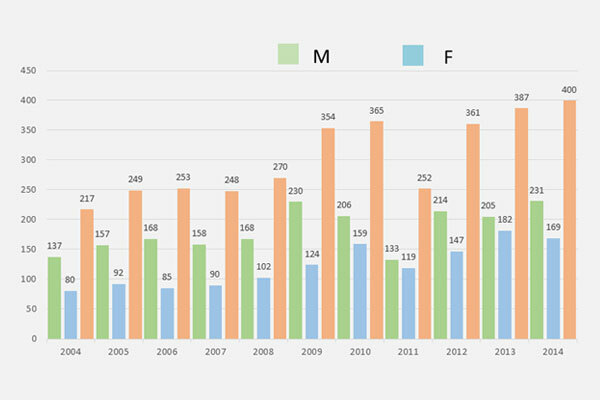 Numbers of lung cancer patient in our hospital (Ramathibodi Hospital) is higher year by year as shown in Figure 1. Currently, the technologies for investigation, diagnosis, and treatment for lung cancer both chemotherapy and targeted therapy are very advance to improve the survival and quality of life for the patients. 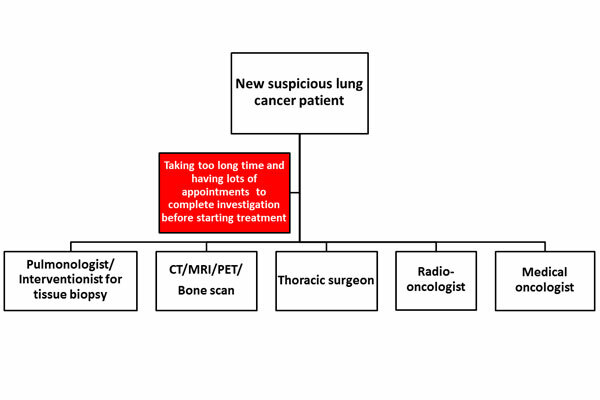 Once the patient is suspected to have lung cancer, then a lot of investigations will be subsequently performed with a lot of appointments to meet the sub-specialties involved in lung cancer field, for example, meeting with pulmonologist/x-ray interventionist for tissue biopsy in order to get the diagnosis and molecular testing, imaging studies will be done for staging disease, meeting with surgeon for planning surgery, and meeting with medical oncologist/radio-oncologist if chemotherapy/targeted therapy or radiation is needed for the treatment. 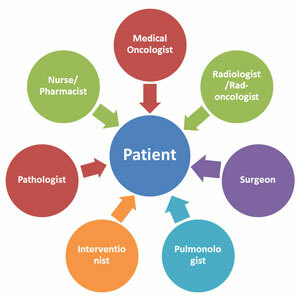 All of these processes sometime take a long time to complete investigation before starting the treatment (Figure 2) which may affect the outcome of treatment including patient’s symptoms, survival, and quality of life. 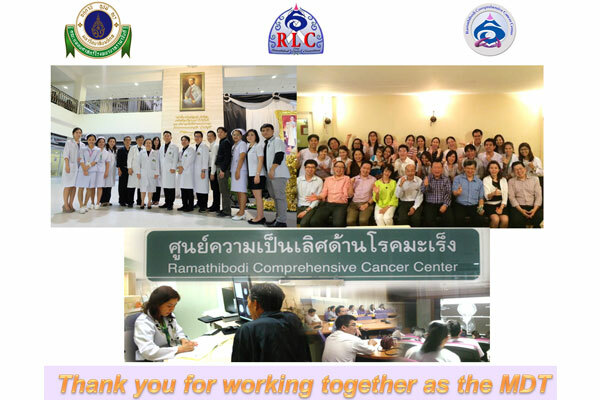 Our group (RLC; Ramathibodi Lung Cancer Consortium) was established on October 7, 2014, aims firstly to help the patients accessing all investigations and treatments faster by review, discussion, seeing the patient and planning the treatment together as the multidisciplinary team and patient-center with one-stop service system as shown in Figure 3. Secondly, our group aims to work on lung cancer research together to explore the new knowledge. Thirdly, we aims to update and educate patients and all personnel involved in lung cancer field including residents and fellows. 1.) We have arranged the RLC meeting every 1st and 3rd Tuesday of the month to review, discuss, and solve the problems for lung cancer patients since October 7, 2014. As of May 2017 (2.5 years), 236 new lung cancer patients were solved all problems by RLC team. We had 15 short lectures before starting the RLC meeting for updating and educating all personnel. We also had 12 RLC committee meetings at the 5th Tuesday of the month to discuss the activities in RLC and how to improve the quality of RLC. 2.) We collected and analyzed the data of lung cancer patient between 2 groups. The first group is the patient whom underwent RLC model (case = 200 cases) and the second group is controlled group which was the patient whom diagnosed and treated before establishing RLC team (control = 81 cases). Our primary endpoint is time from first visit to first treatment [time from suspected to have lung cancer to time of first treatment (surgery, chemotherapy, or radiation)]. Secondary endpoints are time from first visit to first intervention (time from suspected to have lung cancer to time of first biopsy, imaging study, or treatment), number visits from first visit to first treatment. We also did subgroups analysis for time from first visit to first biopsy, time from first visit to first surgery, time from first visit to chemotherapy, and time from first visit to radiation. Median time from first visit to first treatment was significantly decreased in RLC group (14 days) compared to 57 days in control group with hazard ratio of 2.93 (95% CI; 2.21-3.89, P<0.001) (Table 1, Figure 4). 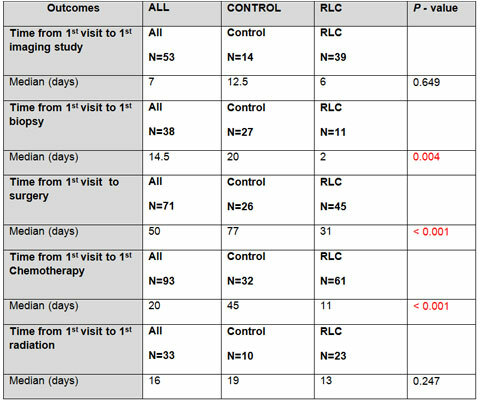 Median time from first visit to first intervention was also significantly decreased in RLC group (2 days) compared to 11 days in control group with hazard ratio of 2.01 (95% CI; 1.53-2.62, P<0.001) (Table 1, Figure 4). Median number of hospital visits was significantly lower in RLC group (2 visits) compared to control group (8 visits) (Table 1, Figure 5). The subgroup analyses were performed and the results were significantly decreased in all secondary outcomes except time from first visit to first imaging study and first radiation because both of time from first visit to these 2 modalities was low in the existing process (Table 2). We performed survival analysis as shown in Figure 6 and Table 3. 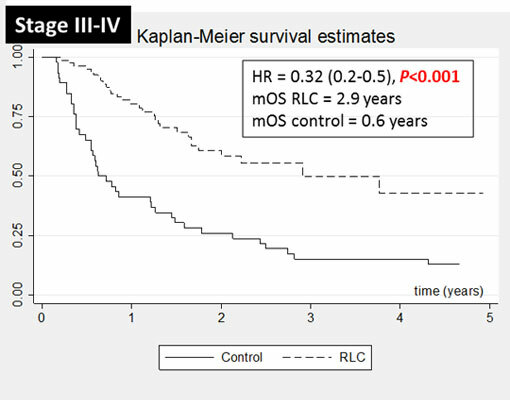 The new lung cancer patients whom underwent RLC model had significantly better median overall survival (OS) and 5-year OS rate, especially in stage 3 and 4 disease (mOS = 2.9 vs 0.6 years, HR=0.32 (95% CI; 0.2-0.5, P<0.001) as shown in figure 7. 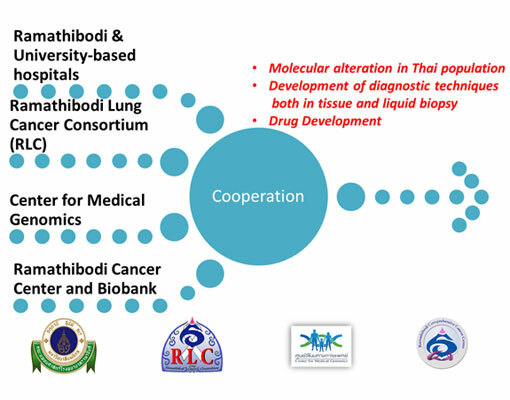 Furthermore, to serve our second aim which is performing the lung cancer research together, currently we have got the government grant to explore the molecular alteration in Thai lung cancer patients and develop in-house molecular testing both in tissue and plasma (Figure 8). 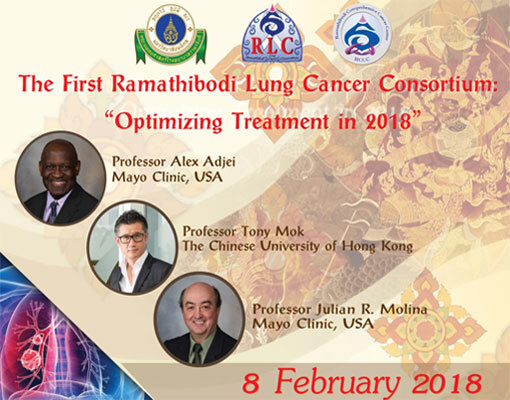 Finally, regarding our last aim about the education, we will arrange the first multidisciplinary team conference in February 2018 (The First Ramathibodi Lung Cancer Consortium: Optimizing treatment 2018). We will have renowned speakers as Professor Alex Adjei, Professor Tony Mok, and Associate Professor Julian Molina joining our conference and being our honor speakers as shown in Figure 9. We have established RLC for totally 3 years. We accomplish our 3 goals. First goal, our patient could access treatment and investigation in short period of time and leading to have the better survival as shown in results part. Second goal, we have the ongoing lung cancer research which we work together to explore and establish the new knowledge in lung cancer field. Third goal, we will arrange the academic conference in February 8, 2017 as mentioned previously. RLC model is the very useful model for lung cancer patients which translate to significantly better survival and all outcomes and RLC model is also the whole picture model for lung cancer treatment for both patients and personnel from BENCH to BEDSIDE.